Prices are for the kit and labor. Crosman 160,180,400, with mini valve mod. Don't see your gun listed or would like to order? I am not hot painting as of right now BUT I have a person that is painting them for me that does a Great job if not better. The price is $70.00 for the paint and that includes the shipping to and from him. The rebuild of the gun is not included. Just need your spare 150,160,180,600,400 exhaust valve rebuilt? 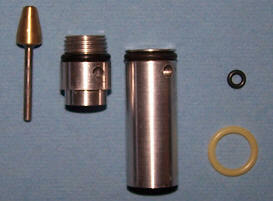 Crosman 150, 160, and 180 exhaust valve. Refurbish your valve face. If you want your exhaust valve assembly rebuilt and you want to rebuild the gun yourself. Just send the valve assembly. With a mini modified valve job, refurbish face, and seals to put back in the gun. All spacers will be shipped USPS Priority Mail.